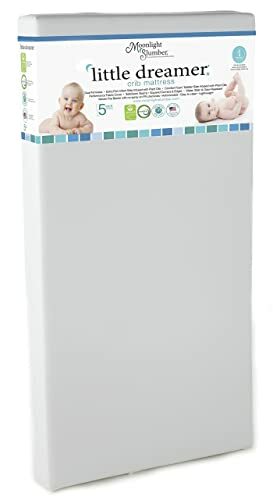 Designed to take your baby from infancy to the toddler stage, the Colgate Eco Classica III Dual Firmness Crib Mattress fits all standard size cribs and toddler beds. Very firm on one side for infant safety, it is softer on the other to provide comfort as your child enters the toddler years. At six inches thick, the Colgate Eco Classica III crib mattress is made with lightweight eco foam for easy handling. The cover is made with certified organic cotton and features a waterproof backing. This mattress is Greenguard Children & Schools Certified, CertiPUR Certified, and made in the USA. Love this mattress. My son slept at most for 4 hours/night until I started using this mattress. He was sleeping for 9 hours at a time within 3 weeks of using it and he’s continued to sleep at least 9 hours/night for the last 9 weeks. I did a ton of research before buying this mattress and it rated better than a lot of $400 mattresses did. I have to say I couldn’t be happier with it. I feel totally safe having my son sleep on this mattress and I love that it’s more environmentally friendly than many others out there. Baby sleeps well on it and it’s absolutely worth the cost to know he’s safe. The mattress and the car seat are two things that are well worth the investment. Who will Appreciate this Mattress? If you are looking for a dual-sided crib mattress with organic components at under $200, then you’re likely to appreciate the Colgate Eco Classica III. Most reviewers are highly pleased and many report that their babies sleep better when they switch to this model. The Delta Children Twinkle Stars Crib & Toddler Mattress is made with a firm, thermos-bonded polyester core. It features a laminated vinyl cover for durability and easy cleanup, and it boasts square corners for a tight fit inside a standard size crib or toddler bed. 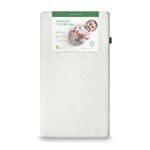 The Delta Children Twinkle Stars crib mattress is Greenguard Gold Certified. This is a pretty good mattress considering the low price. The material is waterproof, which is great for those nighttime accidents. It fits snugly into the crib, so I am not worried about problems with gaps. Overall, we’re happy with this crib mattress. It fits our little one’s convertible crib well and we like the waterproof top vinyl covering. It is lightweight and supportive, plus it fits crib sheets perfectly. Our baby is sleeping well! If you’re looking for a crib mattress under $100 and are not concerned about organic components, then you’ll find that this one is well worth considering. Many reviewers mention how much they appreciate the vinyl cover for its ease of cleanup, and most are very happy with the secure fit. The Dream on Me Spring Crib and Toddler Bed Mattress is made with 80 interwoven, heat tempered coils inside for sturdy support and a firm feel. The sleeping surface features two layers of hypoallergenic cushioning, and an airflow pocket eliminates the need for metal vents. The laminated waterproof cover is stain-resistant for easier cleanup. At five inches thick, this Dream on Me crib mattress fits standard cribs and toddler beds. It is Greenguard Gold certified, and is made in the USA. Great for the money we paid. It’s ideal for toddlers who are potty training as well because it prevents urine from soaking into the mattress. I’ve taken it outside and hosed it down, and I’ve also cleaned it with antibacterial wipes. I like these mattresses for their price and they’re comfortable for both of my boys to sleep on. The are kind of noisy but if you’ve got just one child in the room or your kids are heavy sleepers it shouldn’t be a problem. We bought new toddler beds when we got these and the mattresses fit perfectly. 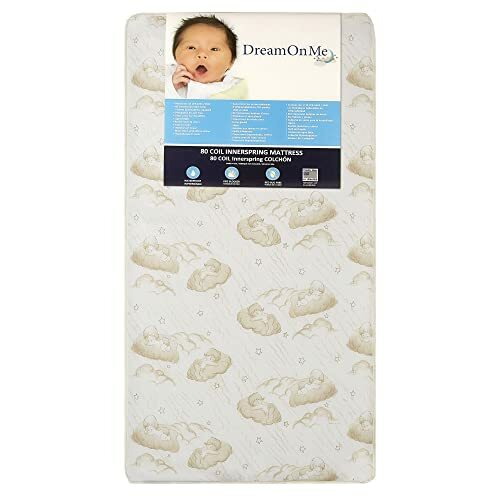 If you’re on a very tight budget and are looking for a safe, easy-to-clean mattress for your baby or toddler, then you might like the Dream on Me spring crib mattress. While it is not reversible, it does fit toddler beds as well as standard sized cribs. It’s worth noting that this model is also popular with people who use crib mattresses as dog beds. At far less than $50, it is our “bargain” pick for best crib mattress. The Milliard Memory Foam Crib Mattress is designed to offer safe, cozy support while encouraging better sleep. 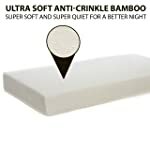 Constructed with a firm foam base and a layer of hypoallergenic 3lb memory foam, it is topped with a waterproof, machine washable bamboo cover that feels snuggly soft on its own or when topped with your favorite sheets. This memory foam crib mattress is CertiPUR Certified. So far I’m impressed with this mattress. If feels like a nice combo of soft and firm and the cover is really nice. My only complaint (and it’s minor) is that the mattress is a little too big for my toddler’s bed so I have to sort of squish it in. Crib mattresses need to fit very tightly for safety’s sake but this feels a little too tight. I’d rather it be a tad oversized than undersized though. Overall, great quality mattress for the price. I went shopping for a nicer crib mattress and was shocked that all the ones I liked were over $300! I received this one with no smell, seemed to be 100% expanded within the first few minutes but I gave it 2 days anyway. The mattress cover is nice and fits well. Using it as a toddler bed for my 2 year old since her crib mattress was getting old; I’ll probably use it for my aging dog with hip problems when my daughter is done with it. If you’re looking for a memory foam crib mattress under $100, then you may very well appreciate this one. The washable, waterproof bamboo cover is a favorite feature, and many parents mention that their babies and toddlers sleep very well on the mattress. Made with five-inches of thick, high-quality hypoallergenic foam for firm support, the Milliard standard crib mattress distributes your baby’s weight evenly while maximizing airflow. A removable waterproof cover makes it easier to clean up after accidents. This crib mattress is CertiPUR Certified. Very happy with this mattress. It was fun to watch it puff up, and there was no weird smell. I like the waterproof cover and most importantly, my daughter easily made the switch from her old mattress and sleeps well. We had no idea our little one hated his old mattress as much as he did. This one is a very tight fit in his crib and makes it impossible to use the drop down rail but that’s a sacrifice we were willing to deal with in trade for good sleep for our little guy! I still use a waterproof mattress cover under a sheet with this mattress as it looks like the cover might be hard to put back on. If you’ve been searching for a comfortable foam crib mattress for under $50, then your baby and your budget will be happy that you found this one. While it contains no memory foam, it does offer the firm support your baby needs without being so hard that it’s uncomfortable. Many parents mention that their infants and toddlers sleep very well on this mattress and quite a few wish it came in “adult” sizes! The Moonlight Slumber Little Dreamer Dual Sleep Surface crib mattress features an extra-firm side for infants and a soft, plush side for toddlers. The covering is made with waterproof medical-grade fabric, which is hypoallergenic as well as dust mite and bed bug resistant, and which can be wiped clean with a damp sponge. Greenguard and CertiPUR certifications inspire confidence and promote peace of mind. The Moonlight Slumber Little Dreamer crib mattress fits standard size cribs and toddler beds, and is made in the USA. My daughter has used this mattress for two full years and I cannot speak highly enough of its quality. It looks as new as the day it was delivered. The waterproofing is great and we’ve had an excellent experience with the firmness of the mattress, no depressions after years of use. Overall highly satisfied and would buy again. We love this mattress! It is safe for infants and has lasted three years so far with no rips, tears, or sagging. We have used the firm side ever since we brought our baby home and we never found a need to flip to the softer side. We also purchased a Moonlight Slumber pack and play mattress and are happy with it as well. 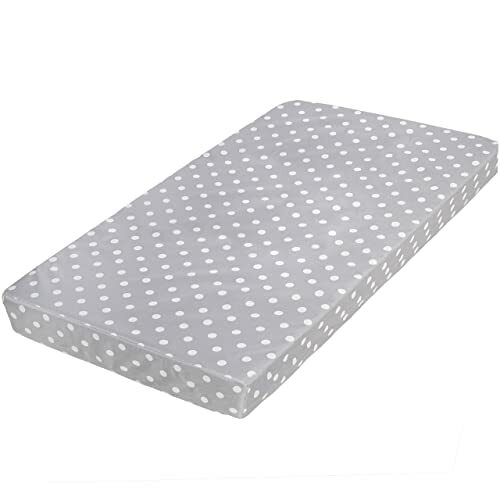 If you are looking for a comfortable, high-quality crib mattress with dual sleeping surfaces and an easily cleaned waterproof cover, then be sure to take a look at this one. While it costs a bit more than some other popular crib mattresses, many reviewers note that their children stay comfortable for years as the mattress retains its shape over time. Most are very happy with the way it fits cribs and toddler beds, as well as with easy sheet changes and good sheet fit. The Naturepedic Organic Cotton Classic 150 Seamless crib mattress features dual sides to allow your child to transition from crib to toddler bed when the time comes. Made with 150 coils and edge support, it is filled with organic cotton and features a waterproof surface that is both nontoxic and easy to wipe clean. This award-winning Naturepedic crib mattress is GOTS certified and meets Greenguard’s strictest standards. It is made in America. This is a safe bed that I feel comfortable laying baby on to sleep, and it is truly waterproof! My little one has had quite a few accidents and it cleans up nicely. I also love that it is manufactured in the USA, and the detail work that goes into making this product makes it one of good quality. I expect it to last for years to come, and if it does it should be worth the price. I love the fact that the mattress had no chemical odor upon opening. The waterproof cover is great, very easy to wipe down with soapy water. While some reviewers say it is too large, I think it’s great – all of my sheets including RHbaby, Burts Bees, and Target fit fine and the mattress is a perfect snug fit for our Pottery Barn Crib. 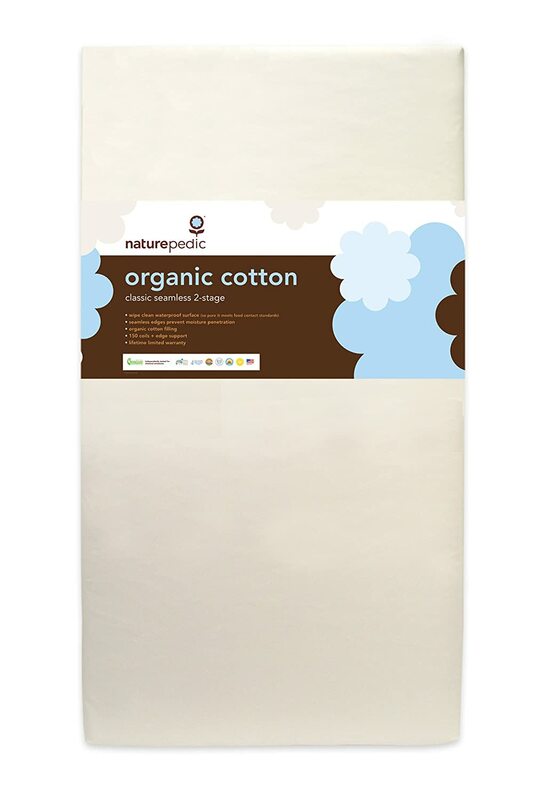 If you’re looking for an all-organic option, then Naturepedic’s No Compromise may very well be the best crib mattress for your little one. While this mattress costs more than most others, it delivers comfortable, safe, chemical-free performance and is designed to last your child from infancy through the toddler years. 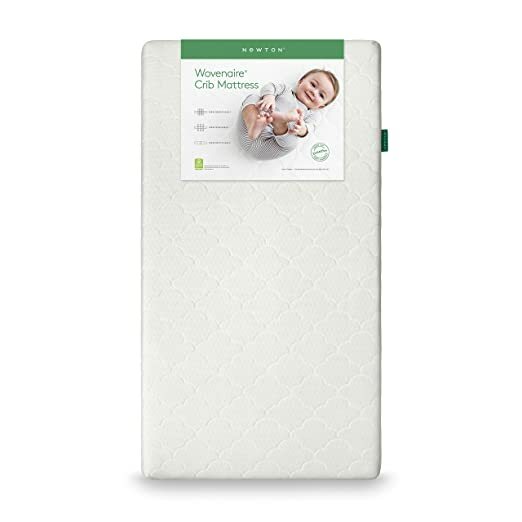 One hundred percent breathable and washable, the Newton Wovenaire crib mattress is unique in that babies can breathe right through the mattress if their faces come into contact with it. The mattress is completely washable as well, and is hypoallergenic, with a Greenguard gold certification. Many pediatricians recommend this crib mattress over others. The Newton Wovenaire crib mattress is made in America with food-grade polymer, and contains 90 percent air by volume. I had a hard time leaving my baby in his crib overnight as I was worried that he would roll over and something would happen. This mattress is amazing! You really can put your face right on it and breathe with no problem. Best of all it is actually comfortable. My baby sleeps with no problem and I rest better knowing it’s ok if he rolls over. I would definitely recommend this to any new parent. We have purchased two of these amazing mattresses, one for our 4-month-old and one for our 20-month-old. I love that it fits both the crib and the toddler bed and made the transition from crib to toddler bed seamless. Our 4-month-old sleeps almost through the night. Worth every penny for the peace of mind, especially when you have kids that just don’t want to sleep on their backs. Parents who are concerned about suffocation caused by babies sleeping on their stomachs are likely to appreciate the Newton Wovenaire crib mattress for its breathability. Many are thrilled that the entire mattress can be washed after an accident, and most report that their babies and toddlers sleep comfortably and soundly. If budget is not your first concern, then you may find this is the best crib mattress for your baby and your own peace of mind. Featuring a high-density thermos-bonded polyester fiber core for steadfast support, the Safety 1st Heavenly Dreams crib mattress is lightweight for easy maneuvering. The waterproof cover wipes clean when accidents happen. This crib mattress is five inches thick, and is Greenguard Gold certified. We were on the hunt for an affordable crib mattress for our first child and stumbled upon this one. I was a bit dubious about it and to be honest it does feel cheap, not heavy or robust. On the other hand, it works well and fits the crib perfectly. It’s a good value. This mattress is well constructed and safe for baby. I felt comfortable from the very beginning and purchased another for our other crib. Our first one looks like new almost two years later with no sag and no staining. There is almost no smell to it at all which is also comforting. Our baby eventually got to the point of sleeping 12 hours per night and having 3 hour naps, so I’m sure he is comfortable with the mattress. If you are looking for an inexpensive crib mattress and you’re not terribly concerned about longevity, then the Safety 1st Heavenly Dreams white crib mattress may be a good choice. While it gets mixed reviews, it is very easy on the budget and quite a few buyers are satisfied with it overall. The Sealy Soybean Foam Core crib mattress is made with renewable soybeans, and it features a firm yet lightweight feel. Designed to promote safe, comfortable sleep for infants and toddlers alike, it also offers convenience via a waterproof cover and binding. This Sealy crib mattress is made in America and carries both Greenguard and CertiPUR Certifications. We’ve been using this for nearly 2 years and we’ve been really happy. It fits, it has a good safe firmness without feeling hard, and our toddler has slept very happily without ever getting limbs stuck. We’re having our second baby and I’m hoping to buy this same mattress again. Exactly what we were looking for! This mattress is easy to wipe clean and it’s light weight for easy sheet changes. I did notice an indentation so I flipped it over to prevent it from wearing too much in one area. The Sealy Soybean Foam Core mattress may be ideal if your budget is around $100 and you’re looking or a high-quality, hypoallergenic mattress that will take your baby comfortably through infancy and into the toddler years. 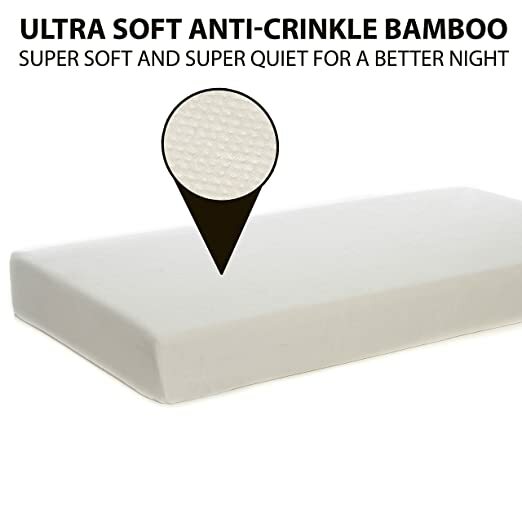 Many parents mention using this mattress for a few years with no problems, and many mention that their children seem very comfortable and sleep well. With so many options available, it can seem difficult to choose the best crib mattress for your baby. Before you make your decision, it’s a great idea to read reviews, and to take advantage of helpful tips like the ones we’re offering here. After all – your little one’s health, safety, and comfort are at stake! Choose a Firm Mattress – Many adults prefer to sleep on soft to medium-firm surfaces, so the concept of choosing a firm mattress for a baby might seem odd. But mattress firmness and baby safety are directly related; in fact, the American Academy of Pediatrics, the National Institute of Child Health and Human Development, and the Consumer Product Safety Commission warns that babies who sleep on soft surfaces are at an increased risk for suffocation. Choose the Right Mattress Size for the Crib – Most cribs are designed to accommodate standard size crib mattresses. If your baby’s crib doesn’t take a standard mattress, measure it to ensure that you choose the right size. It is important to ensure that there are no large gaps that might cause entrapment. Consumer Reports advises against mattresses that allow you to fit more than two fingers between the side of the mattress and the side of the crib. Look for Water Resistance – Water resistant mattresses are easier to clean, and water-resistant or waterproof covers add extra protection. This factor is likely to make your life a bit simpler. Consider an Organic Crib Mattress – While organic crib mattresses tend to cost a bit more than those manufactured with chemicals, there are no byproducts to worry about. If being chemical-free is important to you, then you’ll want to treat your little one to an organic crib mattress. An organic mattress cover can be a good barrier in the event you can’t find an organic mattress that meets the rest of your needs. Don’t be Too Worried About Warranty Coverage – Warranties are important, right? This wisdom rings true for most things but crib mattresses aren’t among them. Your baby will outgrow her crib before the mattress wears out. With these and other factors in mind, we’ve selected ten of the most popular crib mattresses for your consideration, along with more tips for buying the best crib mattress to suit your baby’s needs. How long do you want the mattress to last? If you’ve purchased a convertible crib, or if you are planning to move your baby to a toddler bed when the time comes for him to leave the crib, then longevity may be a very important factor. If you’re buying a crib mattress for occasional use at grandma’s house, or if you know that you won’t be using the same mattress for more than about a year, longevity won’t be a huge concern. Do you want a dual-firmness mattress? While a mattress with a firm side for infants and a softer side for toddlers costs a bit more, it’s also designed to provide your child with a restful, safe sleep surface that supports her growing body. A dual-firmness mattress is likely to last until your little on is old enough to move into a larger bed. Can you return the mattress if it is defective? Like other products, crib mattresses are sometimes defective. Most reputable manufacturers are happy to provide a prompt replacement in the event that a customer has received a defective mattress. It’s a good idea to double-check and ensure that the seller has a sound return policy in place. Is the low price worth it? Sometimes budgets take precedence over other factors. Cheap crib mattresses are out there, and a few of them are decent enough to get your baby through that critical first year. If possible, spend a little more. A good crib mattress that’s easy to clean means less stress for you and sanitary, safe sleep for your little one. What do others have to say? Other parents aren’t shy about sharing their experiences – good, bad, and in-between. Ask friends what they liked and disliked about the mattresses they chose for their babies and see what they think about the choices you’re considering. Keep in mind that the best crib mattresses for others might not suit your needs perfectly, and don’t be afraid to return a mattress if it seems as if something is wrong. While your baby’s safety should be the number one factor, things like comfort, odor, and even appearance can make a difference. Once you’ve chosen the mattress, your little one will let you know what she thinks – and with any luck, she’ll demonstrate approval by settling into a deep, comfortable sleep! AWESOME BLOG! REALLY HELPFUL GUIDE. CHOOSING BEST CRIB ESSENTIAL FOR BABY SAFETY AND COMFORT.I AM TRYING TO BUY A CRIB FOR MY 6 MONTH BABY. BUT THERE ARE AVAILABLE CRIB IN THE MARKET. BUT CHOOSING BEST ONE IT’S REALLY DIFFICULT. THANKS FOR HELPFUL GUIDE TO CHOOSE BEST ONE FOR MY LITTLE ONE. Amazing ! Really helpful guideline! Choosing the best one is really tough Buying right crib mattress in essential for baby health. There are many mattresses available on the market. Thanks for sharing best crib finding guideline. Really helpful guide.